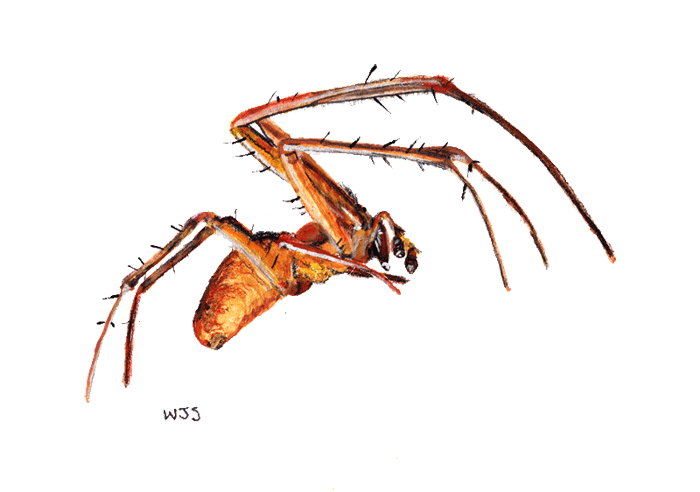 Metellina segmentata, only a recent immigrant to the Americas, is one of the most common orb-weaving spiders in Europe and the British Isles. These pretty spiders, sporting the Cyd Charisse legs (sorry, Cyd) typical of the family Tetragnathidae, are known in Britain as the lesser garden spider and in Europe as the autumn spider. Like all orb weavers, they use various, task-specific silks to construct their webs. They lay down one kind of silk for the frame and radial lines, another kind as a temporary spiral scaffold, and yet another as the permanent capture spiral. Still another kind of silk works well for shrink-wrapping unfortunate insects. Each type of silk is produced in a different type of silk gland—just one of the marvels of spider evolution. We can distinguish the male of this pair by his boxing-glove palpal organs; he will use these bulbs to siphon up sperm he has deposited on a small ribbon of silk known as a sperm web and then deliver it to the female.